Efforts to bolster destination Jamaica’s standing in the global arena have received a major boost with the move by Southwest Airlines to choose Jamaica as the destination for its inaugural flight, as it rolled out its international service July 1. 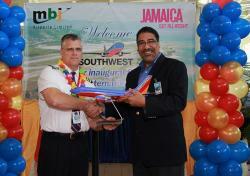 In welcoming Southwest Airlines to Jamaican soil Minister of Tourism and Entertainment, Hon. Dr. Wykeham McNeill said it signals the start of a partnership that will increase Jamaica’s penetration of the US tourism source market. As the largest carrier of domestic passengers in the US, Southwest covers 48 States and links Jamaica through four major gateways. Speaking at a luncheon hosted by the Jamaica Tourist Board and Southwest Airlines at the Half Moon, A Rock Resort, on Tuesday, Minister McNeill lauded the airline’s success. He noted that having started as a small regional carrier in 1971, the fact that Southwest has grown to become the largest carrier of domestic passengers in the USA, is a major achievement. Dr. McNeill explained that Jamaica has already recorded one million stopover visitors for 2014, adding that with additional airlift the country was poised to surpass the historic two million stopover visitor milestone achieved last year. The inaugural flight from Baltimore to Montego Bay, one of three for the day, brought in some 145 passengers; many of them repeat visitors to the island. Senior Director of International Business Management at Southwest Airlines, John Kirby, said the airline has had 41 years of profitability with last year being the most profitable. He outlined a significant growth strategy for Southwest, including acquisition of new aircraft which will increase its fleet by 45 percent come November and add some 650 seats to flights into Jamaica. Chief Executive Officer of MBJ Airports Limited, which operates the Sangster International Airport, Anthony Alicastro hailed the arrival of Southwest Airlines to Jamaica as a major development. “Often in events such as these we try to overstate the importance of an inaugural flight, this is not the case today; today is a really big deal in the aviation world. When the US largest domestic carrier decides to venture overseas it’s a big deal,” he said.